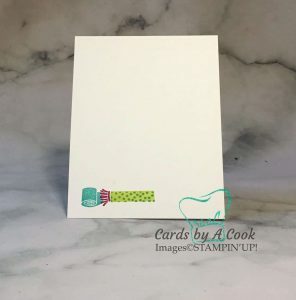 Picture Perfect Stamp Set makes a pretty and simple card. I’ve given up on making New Year’s resolutions I can’t keep – but I really would like to send more birthday cards out to friends and family this year. A simple card like this takes little time to make and will be a good start to my plan. It also suits many different ages and would be perfect for my niece. To make this card I started by picking my favourite piece of coordinating 6X6 page of Picture Perfect paper – cutting a strip and then matching the colours to that. I love pool party with berry bliss! The pool party layer is embossed with the new scattered sequins embossing folder. It gives a deeply embossed impression that adds the perfect touch to the card. If you don’t own a big shot – this step could be skipped and the card would still be pretty. 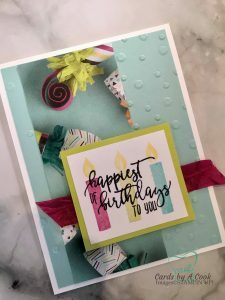 When making the candle greeting I stamped the candles off once onto my scrap paper before stamping onto the whisper white card stock. This allows the colours of the candles to be light enough for the greeting to be stamped on top. The photopolymer stamps make it easy to line up the candle flames. Noise maker adds some fun to the inside. I matched the inside of the card to the outside by stamping a noise maker. The same stamps that make the candles can be used to make these cute party noise makes. (is that the proper name for these thing a majigs?) I stamped the solid part first in lemon lime twist then added bermuda bay polka dots on top. Hope you enjoy this paper and matching stamp set as much as I do. I encourage you to make this year, the year you send more cards!